A worker fuels a KLM aircraft which runs on a blend of biokerosene derived from cooking oil and traditional jet fuel at Schiphol airport in 2011. The world's first flight powered entirely by bio jet fuel will take off next month from Ottawa, the fuel makers announced. 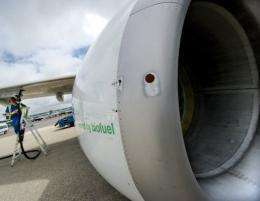 The world's first flight powered entirely by bio jet fuel will take off next month from Ottawa, the fuel makers announced Thursday. Applied Research Associates and Agrisoma Biosciences partnered with the National Research Council of Canada (NRC) to develop a "sustainable source of renewable energy" for the commercial airline industry. In late October, a NRC Falcon 20 twin engine jet will be used to test the new jet fuel made from 100 percent oilseed, for engine performance and emissions. "This will be the first time a jet aircraft is powered by 100 percent, un-blended, renewable jet fuel that meets petroleum jet fuel specifications," said an NRC statement. "Through this initiative, we provide a sustainable option for reducing aviation emissions," said Chuck Red of Applied Research Associates.